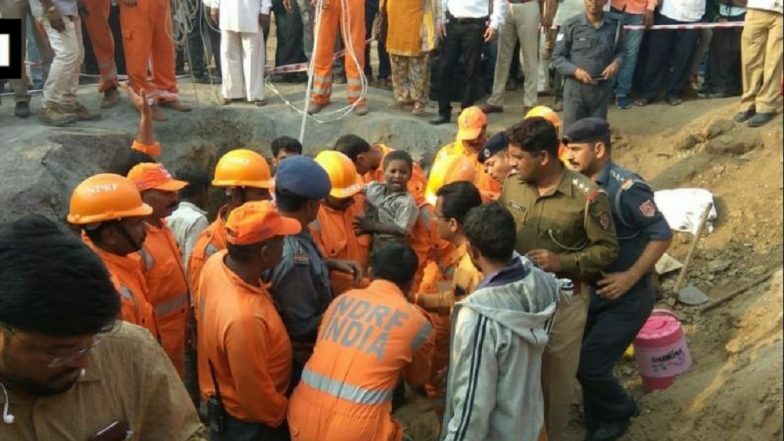 Hisar, March 22: Following a 47-hour rescue operation, a team of NDRF and Indian Army on Friday succeeded in rescuing an 18-month-old boy, who was trapped in a 60-feet borewell. The incident was reported in Balsamand village of Haryana's Hisar district, where the toddler had accidently fallen into the borewell on Wednesday. As the rescuers on Friday reached close to the spot where the child was trapped, digging machines were stopped and the further rescue operation was proceeded manually to ensure that soil does not fall over the infant, officials said. Pune: 6-Year-Old Boy Trapped in Borewell Rescued After 16-Hour Operation. The child, identified as Nadim, was playing with some friends who were plucking fruits from a tree when he suddenly fell into the borewell. Afterwards, the family members and the villagers informed the police. The child's father is a labourer. Earthmovers, drilling machines and other equipment have been pressed into service to rescue the child, even as oxygen tubes were dropped to help him breathe. Biscuits and juices are being supplied to the child. A medical team had also been deployed at the incident site. In 2006, a massive operation was launched to rescue five-year-old Prince, who had fallen into a borewell in a village in Kurukshetra. He was pulled out safely nearly 48 hours later.